Retail $32.00 SAVE 20% ! this drill is very handy to have. it does very well on wood or plastic etc. easy to manipulate and spins at a nice low rpm making it very easy to control. 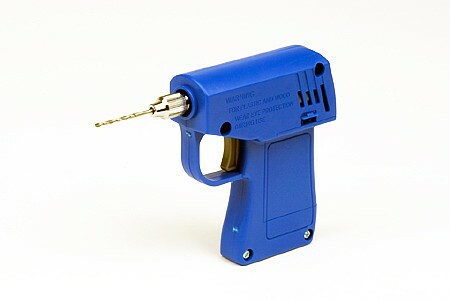 This is a ready to assemble electric handy drill for use with plastic models and wood. "Already using it, fun to assemble too"
Already used it to pin the rotor blades on a Blackhawk Helicopter. "A gotta have tool in the arsenal"
I don&apos;t know how I did without this small but very effective drill! You won&apos;t use your pin vise again for drilling plastic and resin parts. Of course, the best part is that it spins more slowly than the high rpms of your Dremel or other moto-tool, so you&apos;re not melting the plastic as you drill. I&apos;ve used it to drill literally thousands of windows and port holes on my starship and other models. The only quirky thing is that it&apos;s actually a kit that you have to assemble, but that only takes 20 minutes before you&apos;re in business.